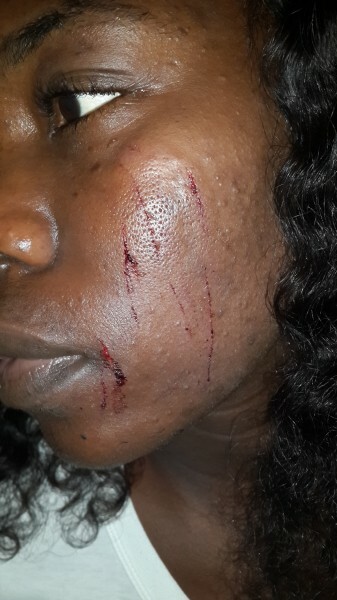 “I got assaulted by a policewoman”: Youth Corper Shares her Ordeal - Corpr! On Wednesday, Twitter was abuzz with a trending conversation about a female youth corper named Odachi Abah, who was allegedly assaulted by a female police officer. Her sister, Ene Abah tweeted about the incident and finally blogged the full version of what happened that afternoon. “On the 8th of October 2014 I got assaulted by a Policewoman. This is what happened. On my way home from Oshodi-Isolo LGA, Lagos State, Nigeria with a friend Maduka Benson after my NYSC clearance our vehicle (Honda accord) entered a hole which pulled part of the car bumper. The policewoman standing in front controlling the traffic kept shouting at us. And so Maduka who was drivin, tried to explain to her that the car bumper was stuck, but she insisted that we should get out of the way. A man told my friend not to move, warning that if he did, the entire bumper would be ripped from the car. He then crossed over to our side of the road, and helped us fix the bumper so we could move on. The policewoman named, Justina, walked towards the window, facing where I was sitting and shouted in broken English “SEE AS YOU FAT LIKE MUMU FULL THE MOTOR.” My friend and I came out from the car asking the woman what we had done wrong to be insulted in that manner. She kept shouting and raising hell. I was wearing my NYSC uniform at the time, so I walked towards her. Surprisingly, she pushed me back and pulled out her weapon (a baton) and hit me on my face three times. The first one knocked my glasses off my face while the rest hit parts of my face which resulted in instant bleeding. I bled for a long time while searching for the woman until I clearly heard her colleagues telling her to run and hide. The police woman took to their advice and ran away. Other policewomen suddenly surfaced at the scene and one of them started calling my friend an armed robber for no reason.We asked them which station they were from, but they refused to tell us. Maduka then decided to block the entire road causing traffic, in order to force the police woman to reveal what police station they were from. Finally, one of the female police officers told us that they were from Makinde police station, in Mafoluku, Oshodi. A few minutes later a police Hilux vehicle arrived at the scene telling us to get back inside our car so we could go to Makinde police station. A police man sat at the back seat in our car, while the rest remained in their vehicle , driving in front of us to Makinde police station. When we got to the station my friend asked for the station officer (S.O) – but they said he wasn’t around. My friend and I tried to explain the situation to the two policewomen we met at the station. Suddenly, one of them started telling my friend to reduce his voice, saying that we should keep the incident a secret. One of the policemen who came to the scene where I was assaulted, approached us and told us that his boss, who is a female, would like to see us in her office. When we got to the office, she summoned the policewoman that assaulted me over the phone and also called another police man named David to investigate the matter. My friend narrated the incident to the police boss in detail. Justina, the policewoman who assaulted me finally came in for questioning. Their boss proceeded to ask her to explain what had happened. The policewoman then began to lie, saying that Maduka and I had beat her up, and that we took her police cap and removed buttons from her uniform. After Justina’s stories, her superior could tell that she was lying. And so she ordered David to put Justina in a police cell. Afterwards we write wrote our statements. The police boss then begged us to forgive Justina. She then took our phone numbers and promised to call us when they need us. We agreed and left the station.